“That’s just not true,” she told more than 100 students, faculty, staff and community members on the OSU campus. The key, she says, isn’t about money or time, but rather developing skills and confidence. This, from a less-than-confident, surprised-by-her-own-success cookbook celebrity. 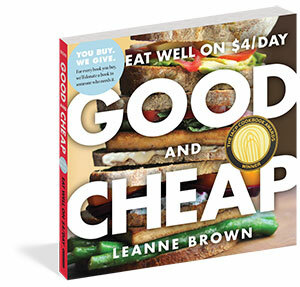 “Good and Cheap: How to Live Well on $4 a Day,” began not as an instant best-seller, but rather as Leanne’s thesis project when she was a graduate student at New York University. There, she researched what it’s like to live on food stamps and eat within its $4-a-day allowance. Once the book was complete, she uploaded a PDF on her website, which she thought only her dad would visit. A Reddit user brought her book to the masses, and since then it has been downloaded more than 925,000 times. She then used Kickstarter to fund a print run, which allowed those who purchased the book to give another copy to someone in need. It became the No. 1 cookbook ever funded by Kickstarter. It was then picked up by a publisher and is now in its second edition. So far, more than 36,500 printed copies have been given to people in need since January, and more than 980 organizations received free or heavily discounted copies. By sharing her story and recipes, honed in her New York City apartment, she hopes to demystify cooking and empower confidence in doubting cooks to help them find joy in the kitchen. 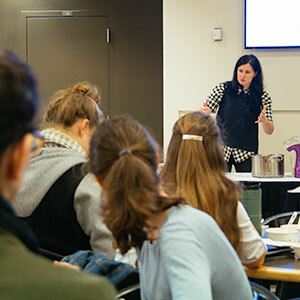 She finds that students, such as the more than 50 who turned out at Oregon State for a presentation and cooking demonstration, are the perfect audience for her message. Her message to OSU students was empowering, and she encouraged them to be flexible, experiment, eat what they enjoy, eat in season and keep a basic pantry of items to return to again and again. To demonstrate, she presented plain popcorn and oatmeal, with a variety of toppings and seasonings. She provided several options for both, which are easy to prepare, inexpensive and nutritious. Popcorn with brown sugar and orange zest. Oatmeal with green onion, cheese and boiled egg. “They’re a great place to teach yourself new flavors,” she said. “The key is to start by making your best version of something you know you like, such as pizza or a stir fry. Experiment and find what you like and what works, then ask yourself: Does it taste good? Do you feel good eating it? Is it worth it? Does it use a basic set of ingredients – stuff you have in the pantry and will use regularly? Leanne’s visit was sponsored by the Moore Family Center for Whole Grain Foods, Nutrition and Preventive Health in the College of Public Health and Human Sciences, University Housing and Dining Services, MU Retail Food Services and BeWell.